BUFFALO — The Islanders had their penalty-kill streak end at 42, but they started a much more important streak with their second straight win. Thomas Greiss made 42 saves and the Isles pulled out a 2-1 victory Thursday night over the Sabres to close 2015 on a good note. 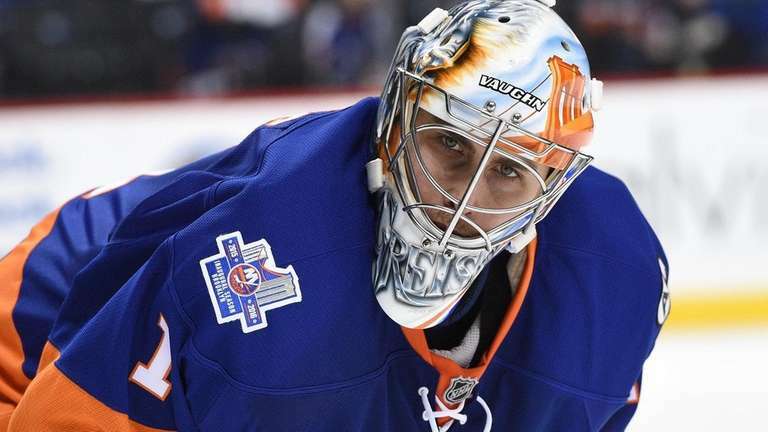 “Thank god for him,” Jack Capuano said of Greiss, who kept the game scoreless with 17 first-period saves as the Sabres, given three power plays including 54 seconds of five-on- three, made like kids at a carnival shooting gallery in a lopsided first. Shots were 16-1 Sabres with five minutes left in the period. Getting to the first intermission scoreless was an accomplishment and the Islanders strengthened with some extended five-on-five time, able to get John Tavares out for a regular shift. And Tavares figured in the opening goal. As Greiss helped the Islanders keep that penalty kill streak alive, the team’s power play was stumbling, on a 1-for-24 slide coming in. Perhaps they learned a lesson from the Sabres’ power play and went for the net. Tavares did, snapping a shot that Sabres rookie goaltender Linus Ullmark stopped but couldn’t cover; Anders Lee helped shovel it loose and Frans Nielsen pounced on the loose puck for a 1-0 lead at 9:35 of the second. Sabres coach Dan Bylsma challenged the goal, saying Lee interfered with Ullmark to jar the puck loose, but the officials confirmed the goal after a review. Nikolay Kulemin’s third goal in as many games, off a strong second effort from Kyle Okposo to Ullmark’s right, was the crucial score 1:07 into the third. The Sabres pressed and ended the Isles’ PK streak with Ryan O’Reilly’s goal with 8:42 to play — he had some room to receive Jack Eichel’s pass when Johnny Boychuk’s stick broke — and then the home side pressed some more, especially when Boychuk left the ice following a hard, shoulder-first collision with the end boards with 4:33 to go. With the net empty, the Sabres were buzzing. But even after 43 shots on Greiss, three Sabres passed up attempts at the top of a crowded Isles zone in the final 25 seconds and the Isles were able to clear and seal it. And the Islanders head into 2016 in second place in the Metro, having finished off a strong December at 8-4-1. They are far from comfortable in their standing, just five points clear of ninth in the East, but they demonstrated once again on Thursday that they have the elements to win games when they start slow or don’t finish strong.